Over the last few years, I have been involved with setting up and running self-initiated and self-directed learning spaces for children studying in classes 5 to 7. In these ‘Resource Rooms’, children work in self-chosen groups, on topics of their choice selected from a library of learning resources, and take their learning forward in line with their own unique interests and inquiries. For instance, a group of children may choose to work on the topic of ‘Butterflies’. The initial learning material would give them some information on the topic, and thereafter, as the children go about studying the material and examining their existing knowledge on butterflies, they would also evolve further inquiries about the same. Next, the children would plan and initiate a process of collaborative research, which would ultimately culminate with a body of knowledge and understanding on the topic of ‘Butterflies’, put together by the children themselves based on their own study and explorations. The teacher’s role in this entire process would be that of a facilitator, guiding and helping the children along, as and when required. Such a learning experience builds in children, not just a sound understanding of the topic at hand, but also a deep engagement with the process of learning itself, which in turn strengthens their capacity to take charge of their own learning. As I have continued working with the Resource Room methodology, I have realized the importance of encouraging and equipping the children to conduct their research work more and more independently. As a logical outcome of the same, I have also realized the importance of making a wide range of high-quality reference books available to the children in the first place. Since the children I work with come from under-resourced socio-economic communities, access to the Internet remains a challenge. Given their limited exposure to the World Wide Web, as also quite often, their developing literacy skills, the Internet doesn’t always serve as the most appropriate tool for research. Besides, I do believe that there is something to be said for the joy and effectiveness of holding a book in one’s hand and reading and rereading its pages! For a while now, therefore, I had been feeling the need to source good reference books for children in the age group of 9-14 on a variety of topics. I wanted to look for reference material which while being informative and rich in detail, was also presented in an engaging and enjoyable manner, material which was written and designed to facilitate both, engagement with and independence in learning. I was also interested in exploring Indian publications, to be able to source material closer to our context wherever useful and possible. I spent part of my summer vacations this year to this effect, and in this article I hope to share the treasures that I found! I sincerely hope that both parents and educators will find these books interesting and useful. In the following sections, I have highlighted a few books across the subject-areas of language, math, science, geography, history, civics, gender and the arts. (You can find a complete list of the books on www.teacherplus.org. Apart from the names of the books, the list also gives information about a few other titles in each subject-area). I am sure many of us have already benefited from the Everyday English book series by Jane Sahi. The three books are filled with delightful language activities, poems and stories on a variety of themes which are both appealing and relevant to children. The books are thus, most helpful in developing effective English language skills in children in an enjoyable and meaningful manner. Picture Reading by Madhuri Purandare is another big hit with the children. The beautiful and detailed illustrations, so close to the children’s experiences, throw up numerous possibilities for language work. The book also comes with suggested language activity ideas, which serve as a wonderful starting point. Batao Mai Kya Kar Raha Hun! a picture reading book published originally by UNESCO and thereafter translated into Hindi by the National Book Trust (NBT) is unique as it provides glimpses of human life and geography, across the various continents of the world. The thoughtful illustrations are accompanied by a playful narrative written as a first person account of a child. Besides providing a host of opportunities for language activities, this picture book also has the potential to help us all become that much more familiar with the world at large! Mathematwist by T V Padma, Khel Khel Mein Ganit by Aivar Yushiel and Romping in Numberland by P K Srinivasan provide an engaging and intriguing collection of math stories and puzzles on a variety of mathematical concepts. These books are sure to facilitate curiosity in children and adults alike, as also take their readers on an enjoyable ride through the world of numbers, enriched with learning and wonder! My First Book of Money by Ravi Subramanian talks about everything a child may like to know about the world of money — bank accounts and bank statements, credit and debit cards, loans and EMIs, currency exchanges, digital money and much more. Written in a simple and engaging story format and accompanied by small activities at the end of each section, this little book packs in a lot of essential information and is sure to serve as a comprehensive guide on money matters for all its young readers. Katie Bagli’s six books under Shree Publications’ Nature’s Delight series are a complete treasure-trove for everything nature – trees, birds, mammals, insects and marine life. Her wonderfully engaging stories and poems teach us so much, and in such a warm and delightful way. The ‘Interesting Tidbits’ at the end of each section add to the readers’ understanding of the species at hand, making the entire reading experience that much more complete and meaningful. The stories in one of the books in this series, How Blue is our Planet? talks about the various environmental concerns facing our planet today in a thought-provoking but non-preachy manner, bound to propel both adults and children into action. Katha publications’ Walk the Grasslands and Walk the Rainforest written by biologists and conservation professionals tell us about the flora and fauna found in these habitats. Written in an engaging story format, these books are wonderfully informative and accompanied by captivating illustrations. Healthy Happy Me and the Get Well Soon series brought out by teri, cover a range of topics to do with health and nutrition. Packed with useful information, the books are written in a fun and lively manner. Ruskin Bond’s Growing up with Trees and The World of Trees, written with characteristic warmth and ease, makes one fall in love with trees. The engaging narratives tell us about the lives of trees and the bird and animal life which abound on them, and also the various myths and fables associated with various trees, sprouting within the reader a deep yearning to renew the close bonds that we humans shared with trees, not so long ago. Both NBT and CBT also have some very informative books in Hindi on the topics of trees, animals, insects and nature. The engaging narratives of these books provide a lot of intriguing information, and are sure to ignite much awe and wonder in their young and not so young readers! The NBT series Vigyan Seekhna covers a range of topics on the solar system, physics, chemistry and biology and could thus serve as useful referencing material. The Read and Colour River Stories series by Tulika are truly a rare treat! A 4-book series, these books trace the journey of some of the most important rivers of our country from their source to the point where they meet the sea. Along the way, the readers are presented with mesmerizing details about the geography of the land that the river traverses, the nature and personalities of the rivers themselves, the lives of the people living along the river banks, the many myths and beliefs associated with the rivers and so on. The illustrations accompanying the text further spark one’s imagination and the opportunity to colour-in the beautiful line drawings enable the readers to add to an already enchanting journey! Geeta Dharmarajan’s book The Case of Runaway Continents lays open the fascinating tale of how our continents were formed, and takes the readers through the details of plate tectonics in manner that is sure to invoke even greater curiosity and awe on this entire subject. The Planet Earth series published by teri provides an effective overview of the key land and water habitats of our planet, including information on the environmental challenges facing the same. Another delightful publication by teri is titled The Natural Wonders of India and talks about 10 of India’s most spectacular natural wonders in a beautiful story format. The way in which the illustrations have been juxtaposed with actual photographs, the little activities at the back as also the glossary at the end, all add to the appeal and usefulness of this book. The NBT series The Story of our Rivers covers many of India’s important rivers and gives rich details about the geographical characteristics of the rivers, as also the key cities, temples, sanctuaries and irrigation projects found along these rivers. NBT also has some very informative books on the key tribes and nomadic communities of India, in both Hindi and English. Another beautiful NBT publication is Magic Islands written by Zai Whitaker. This books helps us understand the history of the Andaman and Nicobar islands, enlightens us with the many reasons which make these islands so special, informs us about the lives of the indigenous people who reside on these islands, and also make us aware of the many environmental and human challenges threatening the preservation and wellbeing of these islands and its inhabitants. Playing Together, also available in Hindi, is another fun publication by NBT. Each of its chapters provides us with some information about India, its trees, birds, animals, states, languages and so on, and each such chapter is followed by a crossword puzzle to be solved based on the information so provided. A Scholastic publication, Amazing India – a State by State Guide is a delightful book which takes one through all the states and union territories of India, providing rich details about its history, geography, culture and more. Presented in a lively and attractive manner, the information provided in this book is both rich and engaging. The Smart Green Civilizations series published by teri is a most unique find! Covering seven ancient civilizations of the world, these beautifully illustrated books not only take us through the life and times of the people of these civilizations, but also educate us on the various environment-friendly practices that were routinely followed by them. The Read and Colour Freedom Stories a 4-book series published by Tulika, tells us about some of the key freedom fighters of our country as also the key events which led to our eventual freedom from the British rule. The engaging narratives accompanied by the beautiful line drawings, both fire one’s imagination and also invite us to add our own colour to the stories. Another unique Tulika publication Shining Stones brings the subject of archeology to life for the children, with its delightful story format and real-life photos of archeological sites. Subhadra Sen Gupta’s Let’s Go Time Travelling and A Children’s History of India are of course other familiar and truly delightful books which make history both relatable and fun for children. The recently released ‘UNESCO World Heritage Sites of India Series’ (5 titles – Sanchi, Mahabalipuram, Keoladeo Bird Sanctuary, Qutub Minar and Chhatrapati Shivaji Terminus) published by Mapin Publishing, appears to be a most delightful addition. 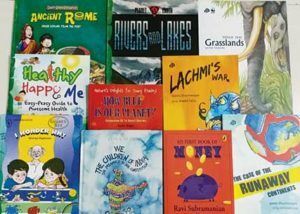 Written in a story-format, and filled with intriguing facts and information, these books are sure to ignite a sense of wonder and amazement in our children’s hearts as they read about our national treasures. We the Children of India by Leila Seth. In this very important book, Leila Seth takes the readers through the words of the Preamble of our Constitution, explaining the meaning and purpose behind the same. The beautiful illustrations add to the appeal of the book, making it a most treasured possession. The Gender Series by Katha, draws our attention to the many disparities faced by the girl child in our society, such as the lack of an equal access to education and equal opportunities for making one’s choices and pursuing one’s dreams. Written in an easy and playful manner, the books however, challenge prevalent societal prejudices very effectively, and compel us to ask the right questions and seek the right answers. Learning Through Art by Jane Sahi and Roshan Sahi, a book which many of us may already be familiar with, teaches us to look at art as a means for facilitating learning, and not as a separate subject or activity. Filled with varied and detailed activities apt for facilitating lessons on language, math and environmental studies, this book is truly one of a kind. The Looking at Art series published by Tulika introduces children to the world of art, including the earliest form of art – cave paintings and to the lives of some of India’s most celebrated artists in a most fun-filled and enchanting manner. These books featuring contemporary, traditional and folk artists, including Amrita Sher-Gil, Maqbool Fida Husain and Paritosh Sen among others, are truly remarkable. NBT has some very informative titles dedicated to Indian music and the visual and performing arts. One especially unique book Together in Dramaland, also available in Hindi, is a collection of children’s plays from countries in the Asian and Pacific region. To say that it is completely overwhelming to be in the company of such a rich, diverse and delightful collection of books is to put it very, very mildly. In the weeks and months to come therefore, I hope to make my way through these wondrous lands of adventure and discovery, inspired and accompanied by the curiosity and perseverance of the children that I work with! There is of course, much that can be added to this collection. And to that effect dear reader, I request your kind help. Please do share with me your own valuable finds and help me make this collection that much more complete! Thanking you in advance, and wishing you a most marvelous journey through the land of books! The author is based in Mumbai, and her work involves setting-up and running self-initiated and self-directed learning spaces called ‘Resource Rooms’, for children studying in Standards 5th to 7th. She can be reached at sonika.lakhera@gmail.com and through her website www.sonikalakhera.com.